Cape Town – This city’s mayor, Patricia de Lille, and SARU chief executive Jurie Roux are to address a media briefing for a “major rugby announcement” at Cape Town Stadium on Friday. The under-utilised World Cup 2010 soccer venue has been the subject of much rugby-related speculation over the past few years -- affecting both the Sevens and XVs codes. As far as Sevens is concerned, the city is known to be fancied by key figures in the International Rugby Board and long-time prominent sponsors like Emirates Airline – it operates a twice-a-day service to Cape Town – for hosting of the annual HSBC Sevens World Series SA leg. Instead Port Elizabeth has had a four-year run as host city, with attendances not always meeting expectation, after the relative backwater of George had a nine-year tenure. Tenders have been invited for a new hosting stint, from the 2015/16 tournament onward, with Port Elizabeth fighting for an extension and Cape Town the other interested party. Sport24 first reported two years ago that a switch to Cape Town for the Sevens was almost a fait accompli -- but then in late 2014 that the Eastern Cape metropolis had swung right back into favour after fierce lobbying by both the EP Kings and Nelson Mandela Bay Metropolitan Municipality to retain it. SARU would not comment on the delicate issue at the time, saying it was in the hands of their executive committee. Cape Town Stadium was back in the news just before Christmas when Western Province Rugby suddenly announced that it would not switch from ageing long-time home Newlands to the bigger, more modern Green Point-located venue after years of delicate negotiation with the City of Cape Town. Cape Town Stadium has been running at a loss of an estimated R40-million a year, while struggling to secure a major anchor tenant. The WPRFU reminded that the union, as owner of Newlands, was “in complete control of its own destiny” whereas it would be a mere tenant at the newer venue. But at national level, Cape Town Stadium has often been thought to be a desirable venue by SARU for international matches. When they released an itinerary of upcoming home Test matches a couple of years ago, certain grounds around the country were specifically named for staging of games in the media release, whereas the words “Cape Town” were intriguingly used for games here – leading to inevitable media speculation at the time that Newlands was not necessarily the cut-and-dried choice. Some of the matches listed have subsequently been either played at, or confirmed for Newlands. In January last year, there were also local reports that Cape Town Stadium might host a Springbok game against a World XV: then Mayoral committee member for tourism, events and marketing Grant Pascoe confirmed that there had been talks with both SARU and the WPRFU. 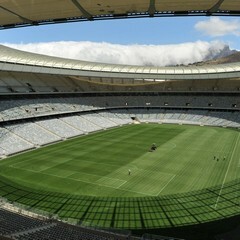 But that fixture later took place in early June at Newlands.